My research interests include a wide variety of projects in both marine and arid systems involving disturbance ecology, landscape ecology, and the physiological ecology and reproductive biology of reptiles and amphibians, with particular interest in Chelonian species. I have been involved in documenting environmental and anthropogenic impacts within desert and marine ecosystems to improve conservation strategies for sensitive species. My current research has centered on advancing clinical and laboratory molecular diagnostics needed to improve animal health, quantify factors related to disease transmission, and improve our understanding of physiological stress in slow-responding species such as the desert tortoise. Drake, K. K, T. C. Esque, K. E. Nussear, L. A. DeFalco, S. Scoles-Sciulla, A. Modlin, and P. A. Medica. 2015. Desert tortoise use of burned habitat in the eastern Mojave Desert. Journal of Wildlife Management 79(4):618-629. Bowen, L., A. K. Miles, K. K. Drake, S. C. Waters, K. E. Nussear, and T. C. Esque. 2015. Integrating gene transcription-based biomarkers to understand desert tortoise and ecosystem health. EcoHealth 12(3):501-512. LeBlanc, A. M., D. C. Rostal, K. K. Drake, K. L. Williams, M. G. Frick, J. Robinette, and D. E. Barnard-Keinath. 2014. The influence of maternal size on the eggs and hatchlings of Loggerhead sea turtles. Southeastern Naturalist 13(3)587:599. Esque, T. C., K. K., Drake, and K. E. Nussear. Water and Food Acquisition and Their Consequences of Life History and Metabolism of North American Tortoises. 2014. Chapter In: Biology and Conservation of North American Tortoises. Eds: D. C. Rostal, E. D. McCoy, and H. R. Mushinsky. John Hopkins Press (Book Chapter). Drake, K. K., K. E. Nussear, T. C. Esque, A. M. Barber, K. M. Vittum, P. A. Medica, C. R. Tracy, and K. W. Hunter Jr. 2012. Does translocation influence physiological stress in the desert tortoise? Animal Conservation 15:560-570. Drake, K. K., P. A. Medica, T. C. Esque, and K. E. Nussear. 2012 Gopherus Agasszii (Agassiz’s Desert Tortoise) Scute Dysecsysis/Sloughing. Herpetological Review 43(3):473-474. Esque, T. C., K. E. Nussear, K. K. Drake, A. D. Walde, K. H. Berry, R. C. Averill- Murray, A. P. Woodman, W.I . Boarman, P. A. Medica, J. Mack, and J. S. Heaton. 2010. Effects of subsidized predators, resource variability, and human population density on desert tortoise populations in the Mojave Desert, USA. Endangered Species Research 12:167-177. Nussear, K. E., T. C. Esque, J. S. Heaton, M. E. Cablk, K. K. Drake, C. Valentin, J. L.Yee, and P. A. Medica. 2008. 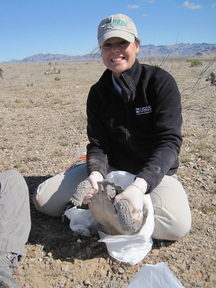 Are wildlife detector dogs or people better at finding desert tortoises (Gopherus agassizii)?. Herpetological Conservation and Biology 3(1):103-115.